Somebody had recently asked me if I had any plans for the upcoming Walpurgis Night. I needed a moment to gather my thoughts before I could respond. 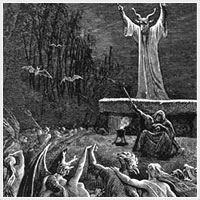 Walpurgis Night is associated with St. Walpurgis who was a fierce opponent of Witchcraft during the European Dark ages. What was meant by ‘did I have plans?’ Was I supposed to visit historic sites of Witches past? I was at a loss for the answer as to why I had been asked if my activities were going to be different upon the eve of the Christian celebration of an infamous Witch hunter and adversary. As most cultures have faced persecution in one form or another, this would be similar enough to asking an individual of a given culture if they would be celebrating the birthday of their oppressor, or if they had any other sort of plans for it. Although St. Walpurgis was seen as a “Witch Hunter”, Walpurgis Night has been a significant day in Witchcraft for centuries, beginning well before the 8th Century A.D. during St. Walpurgis’ lifetime. Walpurgis, sometimes known as Walburga, was the niece of St. Boniface and a devout Christian. She lived in what is now modern-day Germany through most of the 8th Century A.D. She was principal in spreading Christianity through central Europe, and founded many religious houses. St. Walpurgis was a firm opponent of Witchcraft, which did have a significant following during this time. She led several minor crusades against Witches, and wrote a pamphlet concerning the issue. As we have previously discussed, much of the Pagan and Wiccan belief system revolves around turning points throughout the year, such as Yule and Samhain. The end of April and beginning of May constitutes another – the halfway point between the Spring Equinox and the Summer Solstice (known as Beltane), also known as the time when new growth abounds. Additionally, in Roman times, the month of May (particularly May Day) was considered a time when the spirits of the Dead awaken. For these reasons, the end of April and beginning of May can be considered one of the peaks of Witchcraft so what follows can only be considered appropriate. Villagers in Germany and other places in Europe would light fires to drive Witches away from their homes and cattle during the changing of the seasons due to both ignorance and certain practices by Witchcraft past. Later on, the martyrdom of St. Walpurgis was indeed designated on May 1st by the Christian Church. Therefore, the eve of St. Walpurgis Day is on April 30th, a day that has been historically distinguished for the celebration of a significant change in the seasons. 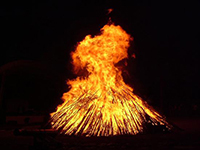 Though nothing should be minimized, stated purely, Walpurgis Night and Day is the name for a particular culture’s celebration of the life of a renowned individual on April 30th and May 1st. To return to the original question: I am very glad that this was brought up, so that I was able to learn about it from a different perspective. I believe, after a fashion, that recognizing Walpurgis Night as a part of Beltane is a good idea. Witches, Pagans, Druids, Shamans, and others of the craft, have face persecution many ways over many decades. I believe that if we let ourselves forget this, we may falter. It is difficult to face persecution and it's history, yes. But remember, most of the Craft follow a code of "an ye harm none". This is akin to "live and let live". We must remember that even though we have been and are persecuted for our belief, whatever it may be, we can not persecute those who have wronged us. We can not look at a Christian, and say, "you are wrong because you are Christian." That would go against everything most of us believe in. I believe in remembering our pain, of things such as Walpurgis Night, Friday the 13th, the Burning Times, etc., this pain that still rattles through our bones, we also remember that we have no right, and I would hope, no desire, to inflict that same suffering on others. Walpurgis Nacht is also Beltane for us. It's not that any of us want to celebrate someone who thought witchcraft was wrong- it's that early Christians knew that witches celebrated on that same night on Hartz Mountain in Germany. Most people *referred* to it as Walpurgis Nacht.. but for us it's Beltane which is the second biggest Sabbat we have.. it''s a time of fertility and celebration, and, like Samhain or Halloween, it's when spirits are about. :-) In fact, it's exactly opposite Halloween/Samhain on the wheel. I ghink of it myself as a Springtime Samhain.